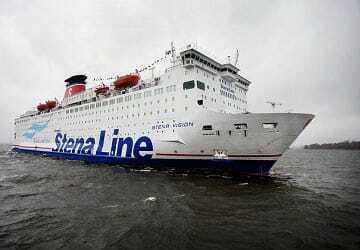 Stena Vision can carry around 1700 passengers and 460 cars. 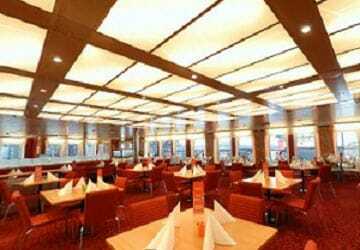 Onboard there is something for everyone including an à la carte restaurant, the Taste buffet restaurant, a large shop, several bars, a spa and numerous fun activities for children are organised during the peak season. 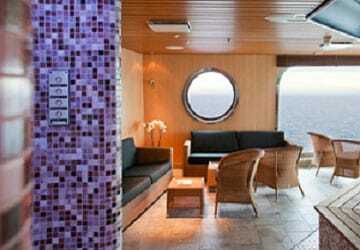 Stena Vision offers a wide choice of cabins ranging from standard inside to a suite with a lovely sea view. All cabins are fitted with DUX mattresses for the best sleeping comfort to ensure you arrive well rested the next morning. 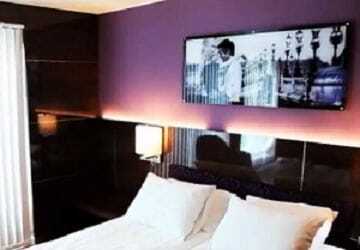 All cabins are en-suite. 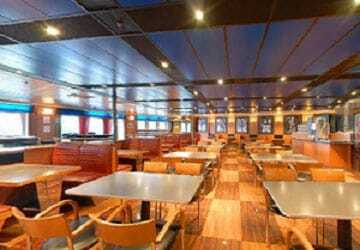 The numerous bars and restaurants on the Stena Vision are spread over 3 decks. On deck 9 you’ll find the stylish 'Riva bar' which in addition to drinks also serves dishes inspired by an Italian kitchen. You’ll also find 'Taste' buffet restaurant where you can get an all-inclusive breakfast or dinner buffet. At night 'Taste' offers an elaborate Scandinavian buffet with fresh salads, hot and cold dishes, snacks and several desserts. The buffet includes beer, wine and soft drinks. 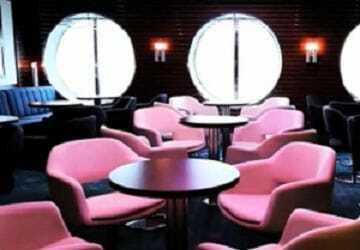 'Metropolitan' à la carte restaurant is where you can enjoy the good things in life. In addition to Polish and Swedish specialities you’ll find a range of lovely seasonal dishes too. When you just want a snack you can head to the 'Food City' self-service restaurant which also features video screens broadcasting films and sporting events. 'Barista Coffee Bar' serves a fine choice of hot drinks as well as Italian sandwiches, salads, sweets and alcoholic beverages. 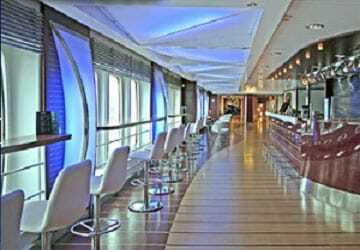 On deck 10 you’ll find the spacious 'C-View bar' which offers wonderful drinks, delicious cocktails and on weekends there’s a DJ playing the latest hits and live bands playing dance music. 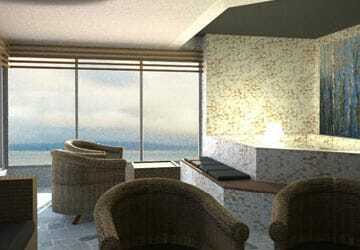 In the Sun deck bar on deck 11 you can enjoy the wide sea view and watch the sun set slowly behind the horizon. 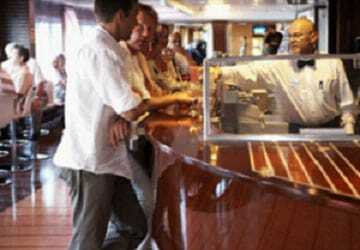 Here they serve beer, wine, alcoholic beverages, ice-cream, snacks and grilled dishes. Shop to your heart’s content in the Stena Vision on board shop on deck 8. 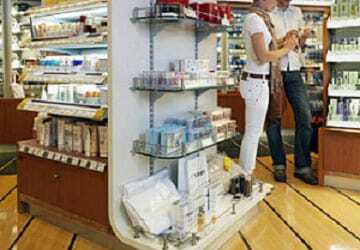 In the conveniently arranged shop there's a wide range of products and all at cheap prices ranging from souvenirs to fragrances and cosmetics and wine. The Stena Vision features the Nordic Season Spa wellness center which includes a sauna, a hot bath, a rejuvenating 'rain shower' and professional beauty treatment that'll leave you feeling totally renewed. On board there are also several WiFi hotspots and there are computers available with internet access in the Internet Lounge. 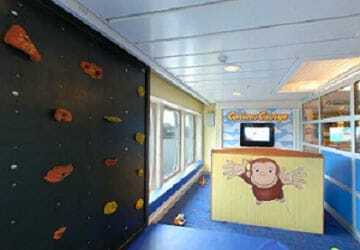 The ship contains a children's play area and there are numerous fun activities to entertain children during the peak season. 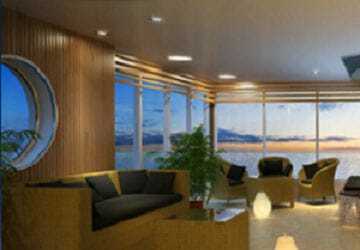 The ship has special cabins adapted for disabled passengers as well as lift access to the decks. Please Note: Whilst we have taken great care in making our Stena Vision guide as accurate as possible, onboard facilities, services and entertainment may vary depending on the date and time of year that you travel, facilities mentioned may change without notification and ferry companies reserve the right to operate vessels other than those mentioned at time of booking without prior notification. We used the ferry for the second time and we are still impressed with its performance. Completely predictable! I enjoyed travelling with you and especially the opportunity to eat dinner at the buffet at the restaurant was a nice experience. Reasonable price and excellent food and self service. A good experience for me and my family. We were launched from Hamburg and went to Oslo with Color Line and on the other hand it has so a slightly older Stena Line ship just hard. It's all right ... but it could also just be all a little better.